While driving back to L.A. from Tennessee last week, we took a few detours. 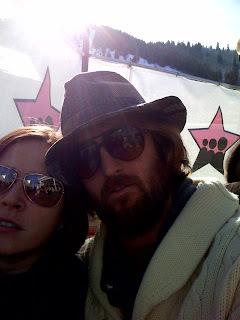 One of these little adventures took us to Sundance. We were offered a place to crash by some buddies as well as all the tickets for screenings they couldn't attend due to conflicts, skiing or desperate need for sleep. We had enough luck and connections to make it into some pretty fun parties and even the ridiculously difficult to get into, "Myspace Cafe," complete with free albeit rather tardy food and Paris Hilton in her little bunny cap. The weather and surroundings were beautiful. The friends we crashed with couldn't have been more fun and generous. At the parties the free drinks flowed, which made it easier to forget the severe ego beating you were forced to endure trying to get inside. The hangovers were easily cured by a few trips to the Brita Hydration Station for a free Nalgene bottle filled with filtered water. And, most importantly, the movies were actually really, really good. All in all, it was awesome.